A Fiber Connector is a Fiber Connector … or is it? Plug-and-play technology has been around for a long time, and it’s one reason why even non-tech-savvy consumers can upgrade and expand their own electronics. We all like plug-and-play capabilities because it’s a fast, easy way to activate a new capability. As the name says, just make the connection and you’re ready to go. The beauty of plug-and-play also extends to the enterprise data center. Constantly evolving network technologies, multiple devices per user, and increased use of bandwidth-hogging applications (such as streaming video) are driving the need for faster data rates. Network managers are always looking for ways to add speed, increase fiber and more easily upgrade their networks to newer technologies. That’s why there’s not much of a debate between multi- vs. single-fiber connectivity. Multi-fiber connectivity (also known as parallel optics) offers significant benefits over single-fiber: smaller footprint, easier scalability, more flexible configuration and—of course—the potential for faster speeds. But a network is only as strong (fast) as its weakest (slowest) link, and network performance often comes down to how well the system is physically connected. Enter the MPO connector. What is an MPO connector, and why is it being used more than ever before? MPO (which stands for “Multi-fiber Push On) is a specific type of multi-fiber connector that’s been around for a few years, but is becoming more popular in data center and enterprise applications. Although multi- and single-fiber connectors are roughly the same size, inside they’re very different. As its name suggests, a single-fiber connector houses a single fiber inside a ceramic ferrule, while a multi-fiber connector contains an array of multiple fibers (either 8, 12, 24, 48 or 72 fibers) across a single connector ferrule. 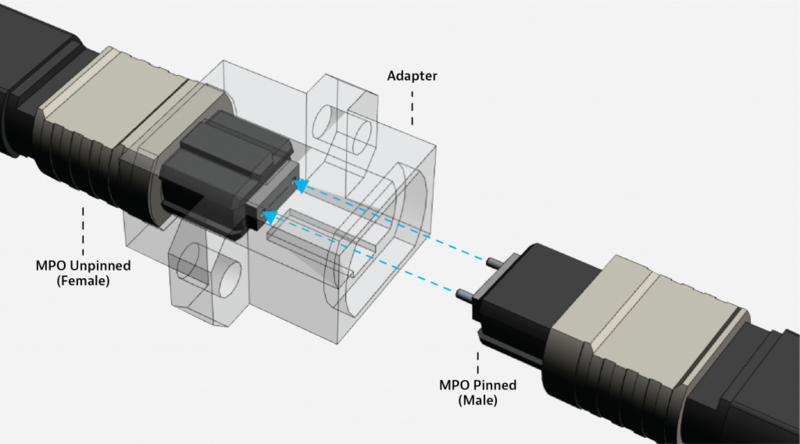 MPO connectors are defined by gender; they are either pinned (male) or unpinned (female) with the pins on a male connector fitting into corresponding sockets of a female connector. Such a connection helps align the fiber end faces as closely as possible to ensure minimal loss of signal. A unique aspect of a multi-fiber connector is its “key”–a bump on one side of the connector to help network techs properly line up cables and connectors for end-to-end polarity. The key helps ensure the correct polarity of fibers, which isn’t readily apparent otherwise and is critical with multiple fibers in a single connector. Faster Speed—parallel optics transmit data differently than single-fiber connectors by using multiple paths instead of just one. This approach can support the higher data rates needed in today’s data center. Port Density–an MPO connector takes up the same space as a single-fiber connector, but can support four circuits instead of just one—a big advantage in data center racks where space is at a premium (which is to say, all of them). Greater Flexibility—getting back to the idea of plug-and-play, MPO connectors eliminate the need to splice cable. The MPO connector becomes the point where network operators can add or swap-out other equipment-specific connectors with ease, kind of like an electrical socket that can accommodate multiple plugs. Ease of Migration—As the demand for high-speed data transmission continues to grow, a more traditional single-fiber connector can’t keep up. Design architectures that use multi-fiber connectors offer the capability to build capacity as data rates increase (say, from 10G to 40G, or even 100G) without completely scrapping existing equipment. What are the benefits of MPO connectors to network techs? Less tedious work in small spaces—no one ever said a data center is roomy. In fact, it’s cramped quarters. MPO connectors use less space overall than the requisite number of single-fiber connectors. For a tech, that means installation and maintenance is easier on the hands. Reduced time and hassle–MPO connectors enable techs to connect 12, 24, 48 or even 72 fibers as quickly as a single fiber. And with MPO connectors, a tech need never splice cable again. Less troubleshooting time–Manual work on single-fiber connectors tends to increase the chance for errors. It’s easier and faster to replace or reconfigure multi-mode connectors, but even more important, it takes less time to verify links or troubleshoot them when something goes wrong. Do MPO connectors have special requirements? An MPO connector is obviously more complex than a single-fiber connector, but not at a burdensome level. As noted above, ensuring correct mating between pinned and unpinned connectors is a more delicate process, particularly because the connectors are usually spring-loaded to ensure a tight fit. Polarity is also a key consideration, but by noting the key location on each connector, documenting polarities from end to end, and following a standard process, this too is easily managed. And while maintaining end face cleanliness is important for all fiber connectors, it’s especially important for multi-fiber connectors. Fortunately, newer tools are coming to market that make it easier to inspect and test MPO connectors according to established standards. Even the standards themselves are evolving to cover MPO-specific requirements. Like plug-and-play technology for consumer electronics, MPO connectors promise an easier, faster way to manage physical network connectivity. They aren’t a new technology, but the way enterprises use MPO connectors continues to expand beyond the backbone to include servers and switches. Initial configuration and testing MPO connectors may be a little more complex, and the standards are always evolving, but the benefits certainly outweigh any issues. We’ll cover standards and testing in a future blog post. In the meantime, VIAVI has produced a white paper, covering the advantages and requirements for successful deployment and testing of MPO connectors. Download it here. es gibt zu diesem Blog-Eintrag eine Übersetzung in deutscher Sprache. Sie können diesen anfordern unter: sales.germany@viavisolutions.com.